Yesterday I had my first “off” day of the trip. Croatians aren’t the warmest people. The legs felt sluggish, and I was tired all day. Cloudy damp weather came in, with a headwind, and I couldn’t find a nice lunch spot so I finally skipped it and started looking for a campsite. It took a long time to find one. They burn the fields here for weed and tick control, and all the side roads were recently burned, smelly and dirty, lots of litter. 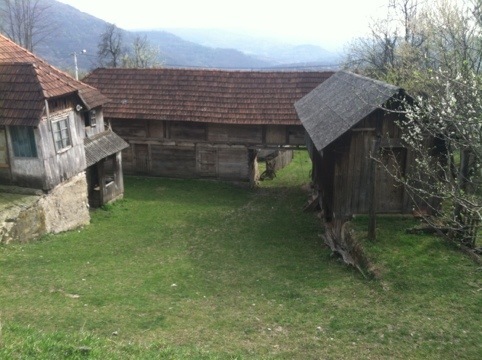 There were plenty of decrepit abandoned houses that Bosnians had left after the war, all dirty and depressing. I finally found a cemetery at the end of a long dirt road way out in the country, kind of unkept but with recent graves, and made my camp there. It was foggy and dismal. In the morning it wasn’t far to Glina, which was hard hit in the war, terribly run down and with half the residents it had before the war. I found a bakery and was eating rolls in front, inches from the traffic in the dusty street. Then along came Petar. In his fifties with a gold tooth and a quick smile, his only English was, “Oh my god!”. He pantomimed me over to his shoe repair shop, then to a cafe to meet up with Nedeljko, his English-speaking friend. Petar also drives a city bus in Zagreb (and by Jesus he resembles my friend Reed who drives a city bus, too), and Nedeljko repairs appliances. They wanted the whole story, which required more time, so lunch was planned. First a quick tour of Petar’s “farm”, an in-town barn and pasture hidden behind a big door between two buildings. Goats, rabbits, chickens, turkeys, and a horse in a chaotic barnyard scene. Then to Nedeljko’s for wi-fi (no luck fixing gmail), then to Petar’s house for lunch. Big fried fish, a dish with carrots, onions, cauliflower and something else, delicious, and good bread, in a kitchen with a wood stove and a lot of incredible plants. 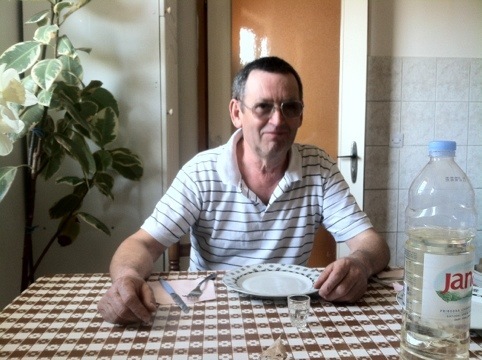 Nedeljko had stayed home, so a neighborhood boy of twelve was called in to interpret. Schnapps? Why not. It was home made, distilled from plums. It seems everywhere I go there are home made alcoholic beverages. They wanted me to stay the night but I had only gone 15 kilometers, and it was only 2:00PM. Soon I was on the road with both men. 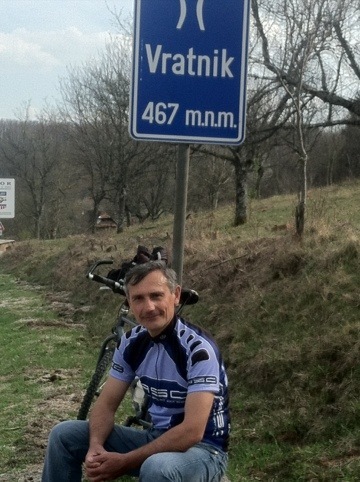 Petar left us at his brother’s house, 6 kilometers from town; Nedeljko rode with me 30 kilometers to the top of a mountain pass. Here we sat as I learned more about the war. Every generation for centuries there has been war, their curse Nedeljko said. He pointed out a village on the mountainside that was empty, no inhabitants. Bosnians had lived there when this was all Yugoslavia; they left for Bosnia-Herzgovenia, an hour drive away, after the war. We talked. He is a bicycle man with a nice vintage Italian road bike and a nice vintage American mountain bike. He’s the first Jehova’s Witness I ever met who didn’t talk about it. We shared a lot of good conversation at the top of that pass, sat silently for a while listening to the wind, then parted. Then a long downhill past more abandoned homes, old ladies hoeing in fields, men in tractors, and many old men sitting in the sun in door yards, brought me to Dvor, on the Bosnia-Herzgovenia border at dusk. Snow was forecast (I couldn’t believe it but we’ll see). I found a room in an off-season hunting lodge run by the Butic family. 22-year old Matea speaks the best English I’ve heard in Croatia so far; she learned it by watching movies when she couldn’t get into the English class at school. She’s a sweetheart, and we are already friends on Facebook. Gordana and Josip are celebrating their 37-year anniversary. A great country meal of chicken, rice, and home-made bread was accompanied by home-made schnapps. Again! Josip grows corn to feed to wild game animals on the mountain behind the farm. Matea studies wildlife management and hunting at college. That’s right, hunting. Boar and deer hides, mounted antlers and game birds decorate the place. An hour after dinner I was invited down to the kitchen for crêpes with home-made jam. I’ve been promised home-made sausage for breakfast. Looks like I found the right people in Croatia after all. I’ll be leaving this country tomorrow morning with a smile on my face. Billy. You bring out the best in people wherever you go. Glad to hear you are mishap-free for awhile & that everything seems to be going great! hi billy is stjepan from glina nice blog! !